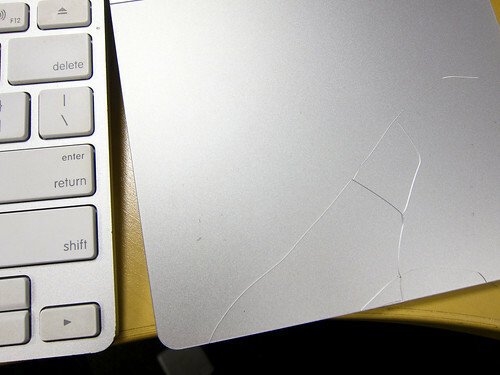 Cracks in Apple’s Magic Trackpad, originally uploaded by zokuga. I’ve owned the Apple Magic Trackpad since it came out in late July. Even at its steep price, I’ve considered it a worthwhile purchase…essential when my laptop is on a stand, and useful even at the coffeeshop, when paired with the wireless keyboard, so I can keep the coffee away from the actual laptop. I’ve carried it uncovered inside my leather messenger bag…I don’t exactly throw that bag around, since it almost always has my laptop in it. But at some point last week, something cracked the trackpad, and now it’s grown into a crack halfway across the pad. This entry was posted in thoughts on October 6, 2010 by Dan Nguyen.